Sol Power- solar powered cell phone charger- and assists with finding beta sites for pilot testing. Mango Networks helps organize and host events to raise awareness about renewable energy. Strategic partnerships and fundraisers to bring Solar chargers to Haiti after the Earthquake. Jan Schlichtmann, Environmental lawyer famous for the Woburn water case as portrayed in the movie A Civil Act, Lisa Lillelund Solar Now Board member, and Fred Hopps Solar Now Board member visit the solar field in Beverly with 3 generations of photovoltaic arrays- all made in Massachusetts- 1980, 1997, 2001. 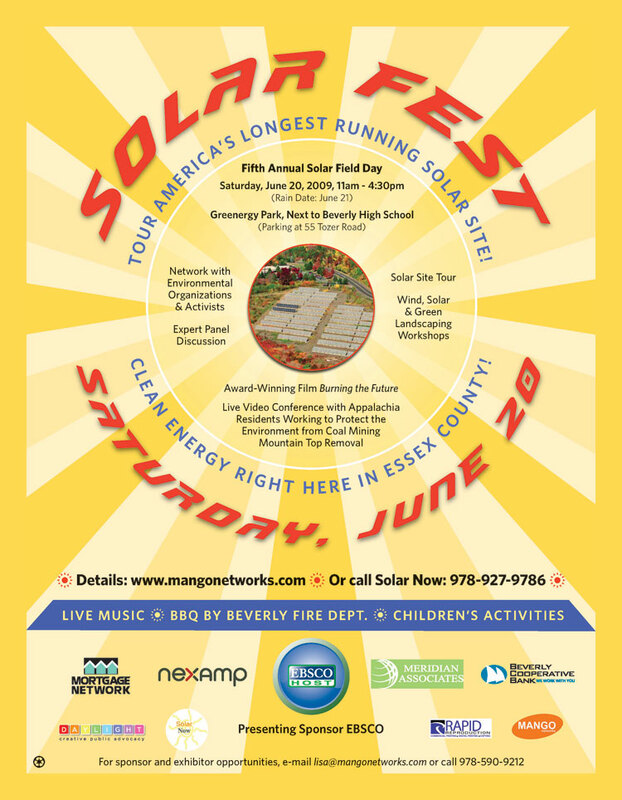 Newspaper and online Press coverage for Solar Fest.